SOLitrack™ Print Manager is a database-centric output management system that uses a web-based interface to control and track print files. Designed to manage high volume transactional printing workflows, SOLitrack provides a number of features that simplify security, status tracking, and accounting in production data centers and distributed print environments. Building on a history of successful technology development, SOLitrack demonstrates Solimar’s continued commitment to delivering powerful output management solutions for its clients. SOLitrack is like a GPS system for your documents, it tracks the job status and current conditions of high volume transactional print workflows. Print service providers and organizations with fleets of printers often have a difficult time knowing real-time status of their projects. SOLitrack is well suited to organizations that experience dynamic changes to production workflows and need to make real-time adjustments and decisions concerning available print devices, workloads, and job priorities. In addition to flexible database-driven event reporting, SOLitrack provides accounting data for bill-backs and invoicing. Batching is the process of collecting together production print jobs that are associated with the same product attributes into a “batch”. The combined output can then be processed as a single job to achieve greater production efficiencies and cost savings. Increasingly, a trend seen by production print facilities has been toward an increase in smaller, more transactional jobs. However, from an operational standpoint, large batch jobs are much more efficient. This presents a dilemma for companies, who are trying to reconcile the need to achieve greater efficiencies across their operations with the fact that they are receiving smaller batch jobs. Householding to combine mailpieces targeted at the same address into one envelope for postage savings and recipient convenience. Digital commingling enables increased postal discounts by concentrating more mailpieces in each geographical region per production run. Streamlined print production as larger print runs keep printers and finishing equipment running more efficiently with less setup-up time. Operational flexibility by optimizing batches and batch sizes for production processes instead of forcing workflows to work around different size jobs. Tracking jobs within batches for reconciliation and reporting. Managing SLA scheduling of jobs by automatically pulling them into batches based on SLA deadlines. 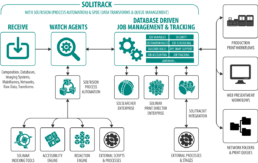 Automating manual processes related to combining jobs based on common attributes and production schedules. Provides real-time job and printer status feedback. Logs job processing information for reporting. 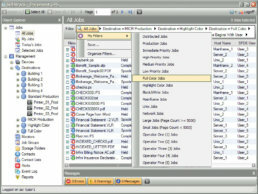 When an operator is ready to act upon a job they can easily manage the attributes of a single job or groups of jobs to control down line processing of the file. If jobs are being manually controlled users simply select the jobs and modify the attributes (security permitting) from drop down menus or fields and then apply the desired changes. Based on the applied attributes SOLitrack will take the appropriate actions on the jobs. SOLitrack’s intuitive interface provides print operators and administrators with a powerful tool to manage and monitor printer activity and processing status of print files. From one screen users can apply filters to quickly locate needed information. SOLitrack reports on and manages files that processed through the system as well as files printed outside of SOLitrack’s control. 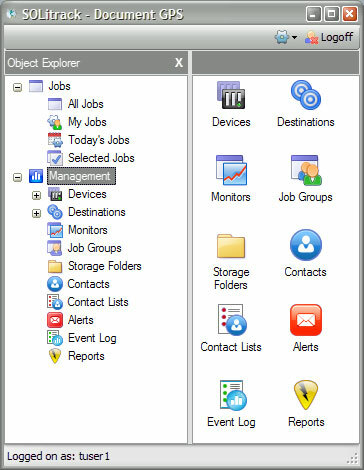 The tree view of SOLitrack’s other settings organizes items in an easy to navigate structure. 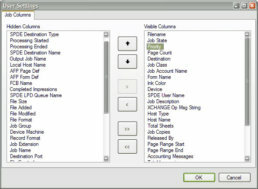 Users can run reports on any aspect of the workflow that has been tracked and logged to the back-end database. 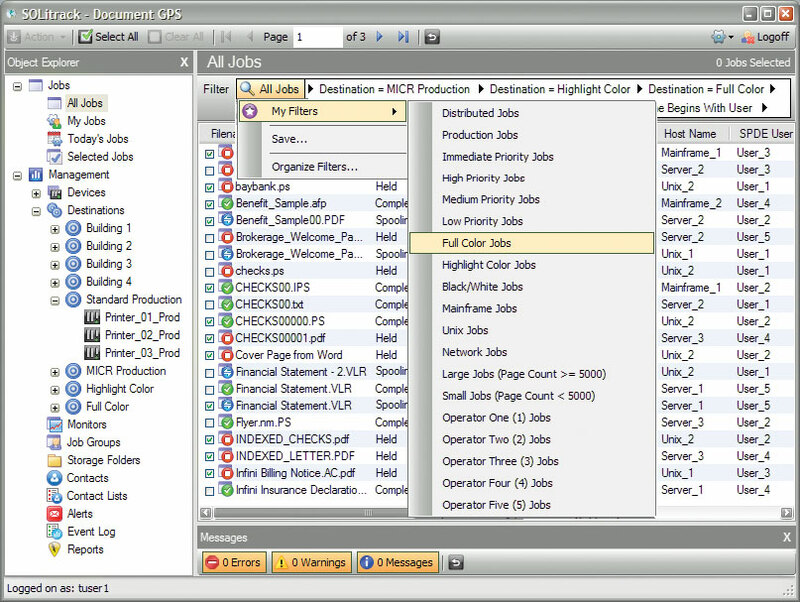 SOLitrack utilizes dozens of Job Attributes to manage print files. 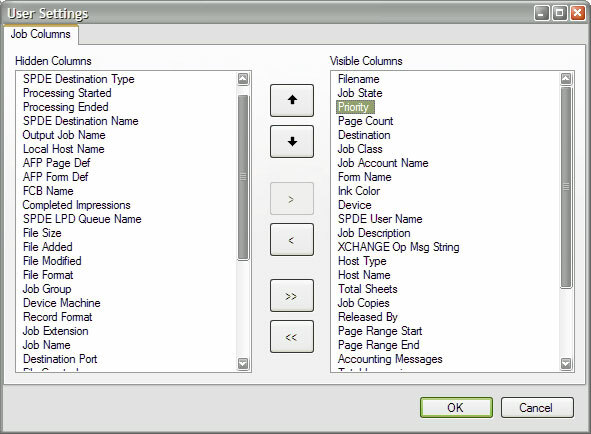 Job Attributes can be passed to SOLitrack with the input print files or assigned to each file dynamically as they are processed. The Job Attributes are then used to control how each file is managed such as who can access the job, automated or manual processing, job priority, and destination controls such as failover, load balanced, round-robin or distribution list queues among others. 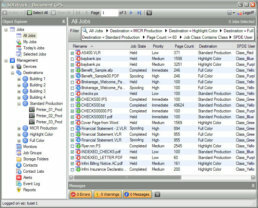 The Job Attributes are also used to optimize print operator efficiencies by enabling them to quickly filter through all jobs to find what needs attention. In addition Job Attributes provide SOLitrack’s customizable reporting capability to contain as much or as little information as is needed for job reconciliation, tracking and billing. SOLitrack’s ‘breadcrumb’ filtering provides users with an efficient method to quickly locate the print jobs they are interested in managing with just a few clicks. 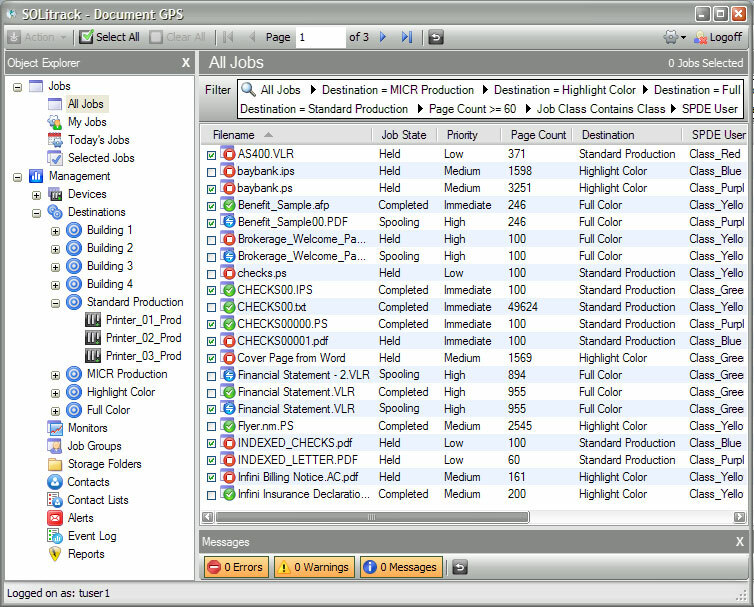 The ‘breadcrumb’ trail of filters is easily defined with drop down menus that group the Job Attributes used by SOLitrack to track and identify jobs that operators need to manage. Filtering rules that are commonly used can be saved and referenced to provide users with the utmost in productivity control for job access, monitoring processing or their workload. Whether SOLitrack is controlling a few production printers or thousands of distributed printers, its intuitive web-based UI provides simple administration and operation of the system. 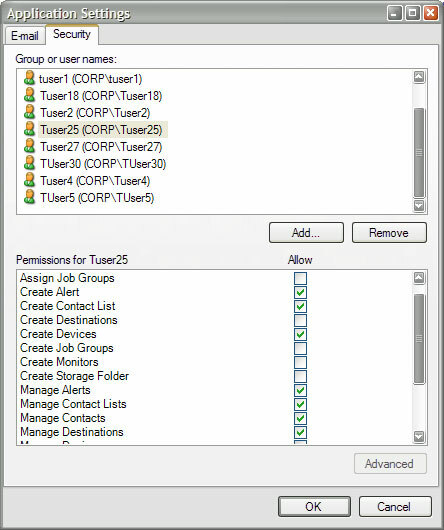 Security options defined by administrators determine what settings users will see when they connect to the system. This makes the interface for users clean and simple since they will only see the aspects of the workflow that pertain to their responsibilities. SOLitrack provides granular security that enables companies to control all aspects of the system including exactly what actions and access users have rights to. 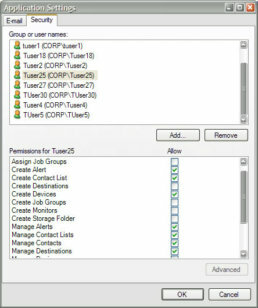 Additional security settings control what information or reports users have access to, their level of management and their options pertaining to the jobs. This allows companies to strictly control security for sensitive documents and activities related to print while SOLitrack logs and tracks all operator activity.